With the winter landscape covered in snow for the past week, the conditions were perfect for watching a particular(and perhaps peculiar) group of birds: Field Birds. While not an actual category or official designation in ornithological terms, “field birds” are those small birds that inhabit open fields and barren habitats. 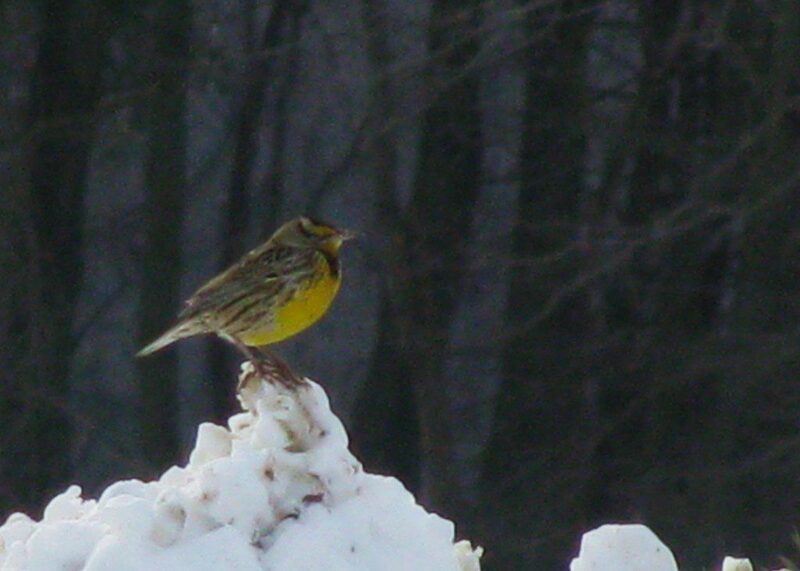 In the winter months, flocks of Horned Larks, American Pipits, and Eastern Meadowlarks converge upon the vast agricultural fields in our region. Often ocurring in mixed flocks of dozens or even hundreds, these birds search for seeds to eat as they work through a field. All these species have cryptic coloration on their backs, helping them blend into the landscapes of brown, gray, and white where they typically are found. The chests and faces of these birds, however, offer a bright contrast to their dull upperparts: bright egg-yolk yellow on the chest of the Eastern Meadowlark, and the lemon yellow face of the Horned Lark. Black masks on both these species may serve to shield them from sun glare on the bright expanses of snowfields and prairie where they roam. 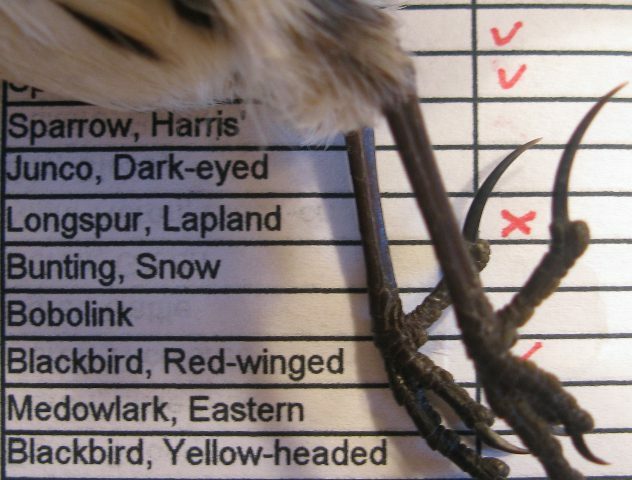 The true prizes to find amidst these flocks are of course the less-common “field birds”: Snow Buntings and Lapland Longspurs. Both these species breed on the Arctic tundra, adding to their allure and intrigue. The name longspur refers to the elongated hind claw(also called a hallux) that these birds possess, a key feature that all field birds share. In the windy, open expanses that they frequent, a long claw helps them keep a good grip on the ground. Rarely do these birds perch in trees or anywhere but the ground. In fact, they even roost on the ground in fields, where I’ve encountered flocks many times while walking or driving through fields at night. A good snow makes it much easier to pick out flocks of field birds, as their dark bodies stand out against the white background. 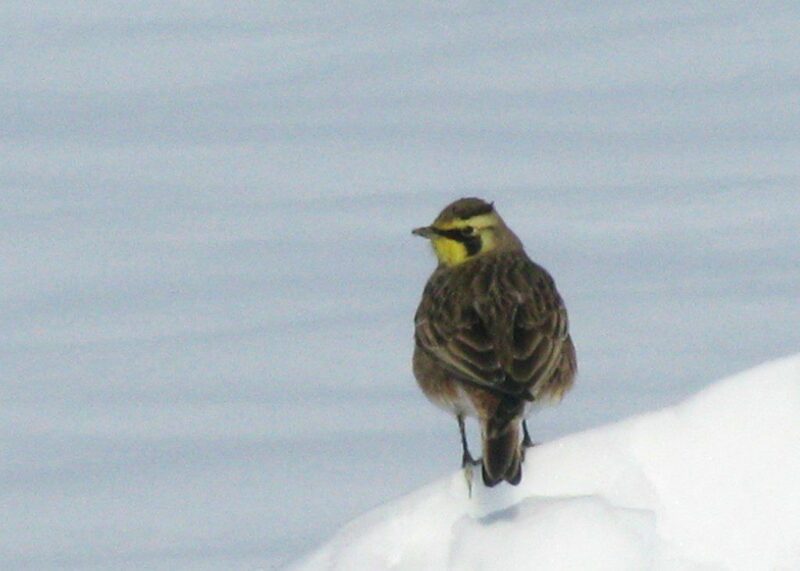 As a bonus, these birds often feed on the cleared edges of roadsides after snow, making it easier to view them up close. As we head into the depths of winter, I hope you encounter some of these interesting field birds and make their acquaintance. Wait for the next snowfall! Today at the DuPont Environmental Education Center in Wilmington, we had two refuge residents treat us to an afternoon of great views. They were intent on having lunch without regard to us – the gawking onlookers. Who were they? A pair of raccoons! This was an unexpected sight, as raccoons are nocturnal and are rarely seen during the day. 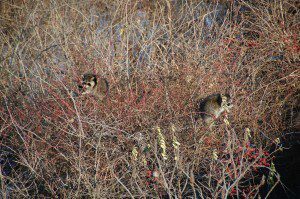 Seeing a raccoon in the daytime does not necessarily mean it is rabid (but they are wild animals so still keep your distance). Like the red fox, raccoons are sometimes active in daylight to take advantage of available food sources and this especially true when there is snow covering the ground and their favorite pond is frozen over! Raccoons are omnivores so they eat plant and animal material. It appears that today’s food of choice is hips from the invasive multi-flora rose. Joining them were mockingbirds and a sundry of sparrows who also thought today was a good day for roses. 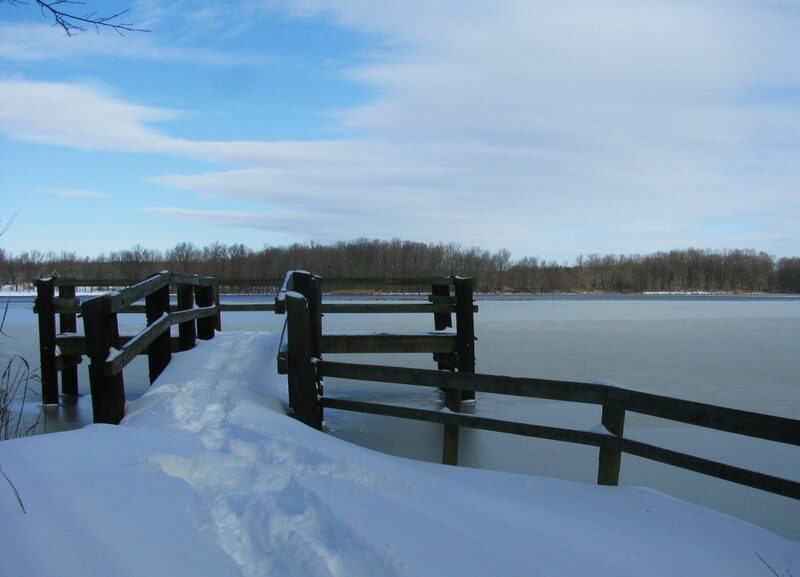 Come down to the Dupont Environmental Education Center for a winter walk around the boardwalk! 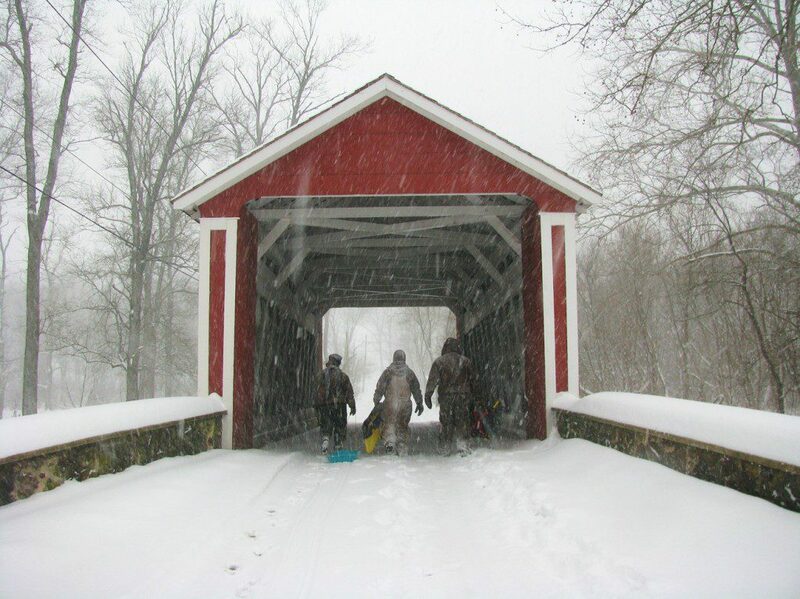 Sleds in hand, these visitors trek to Sledding Hill takes through the Ashland Covered Bridge during the middle of the snowstorm on Saturday, December 19. A bright male Northern Cardinal provides a classic splash of color against a snow-covered bush near Lums Pond State Park. 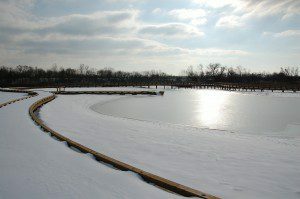 A frozen Lums Pond sits icy and gray against a blue sky, during the Middletown Christmas Bird Count on Sunday, December 20. 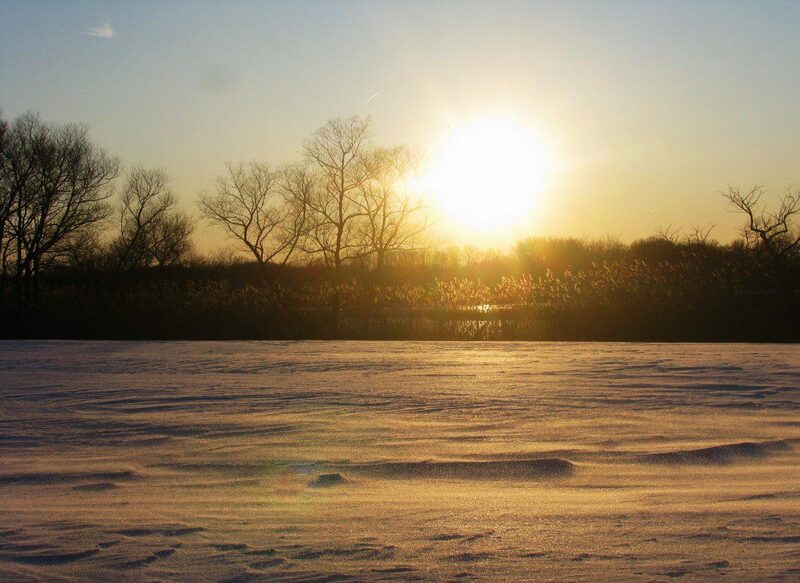 The sunset shimmers Sunday against millions of granules of snow at Dragon Run Marsh, looking like the grains of sand on a beach. 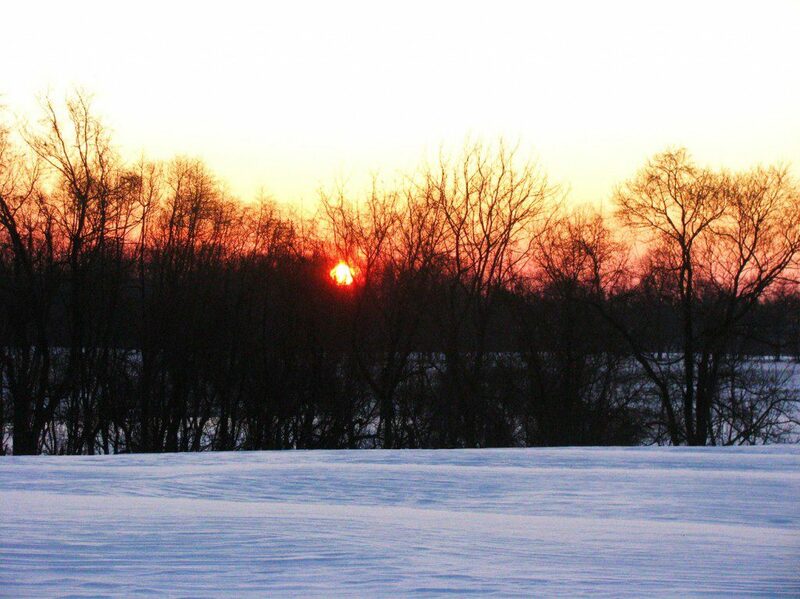 The sun rises on Monday at the Red Clay Reservation, illuminating the blue and purple fields of snow. This past weekend was not really a good time to go out on a nature expedition. 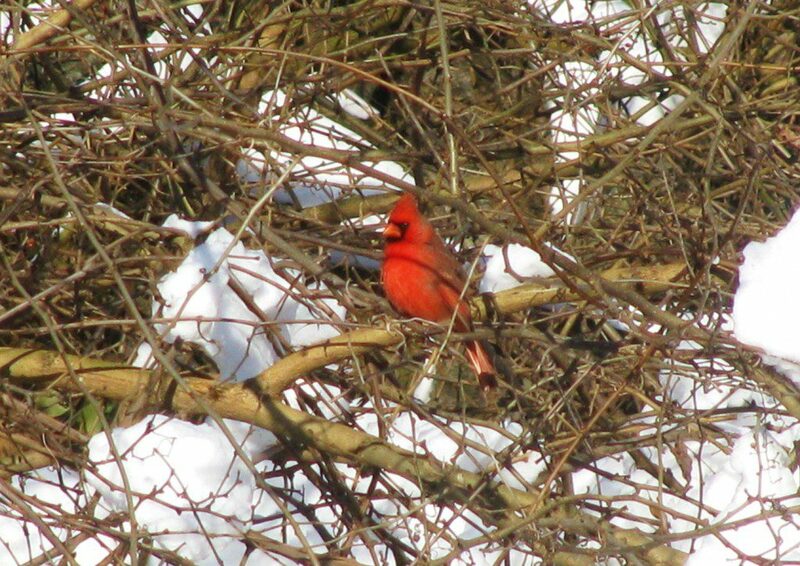 Duty called, however, since the Middletown Christmas Bird Count was held on Sunday, despite almost two feet of snow on the ground, a declared state of emergency in Delaware, and mostly unplowed roads. Since I am an area leader, I was obligated to take a stab at doing the count. My wife thought I was crazy. I probably would have stayed home and enjoyed a nice fire and football games, but my four-wheel drive vehicle was begging to get out, so I headed down to my area near Delaware City. Typically, I don’t go birding when the Delaware National Guard are roving around in Humvees, abandoned vehicles lay scattered along roadsides, waist-high snow drifts await my discovery, and biting winds produce sideways icicles. If a little tiny sparrow can survive out there, so could I! 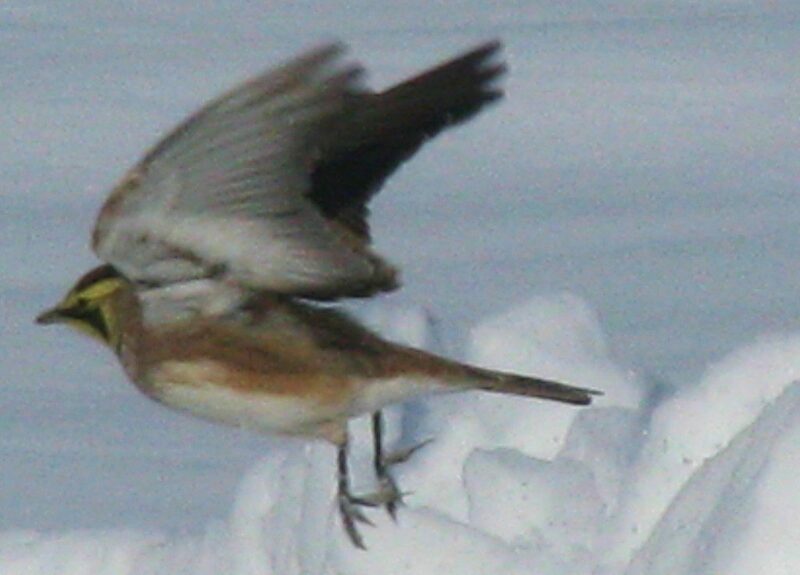 Birds effortlessly found seeds on top of the snow. Perhaps it is easier than finding brown seeds in brown dirt. Maybe seed-eating birds welcome the snow! Gulls floated in the choppy Delaware Bay waters. Hawks cruised by in the high winds, and Canada Geese were flying around everywhere looking for a good place to land and feed. There was very little real estate around that wasn’t under deep snow. Sideways icicles line the railing at the waterfont in Delaware City for the Middletown Christmas Bird Count. Derek Stoner also made it down that afternoon and counted birds around Lums Pond State Park. He reported seeing small patches of open water, where Bald Eagles waited to pick off plump American Coots. Mostly limited to where we could drive, the birding was slow, but Derek Stoner and I managed to find about 60 species. 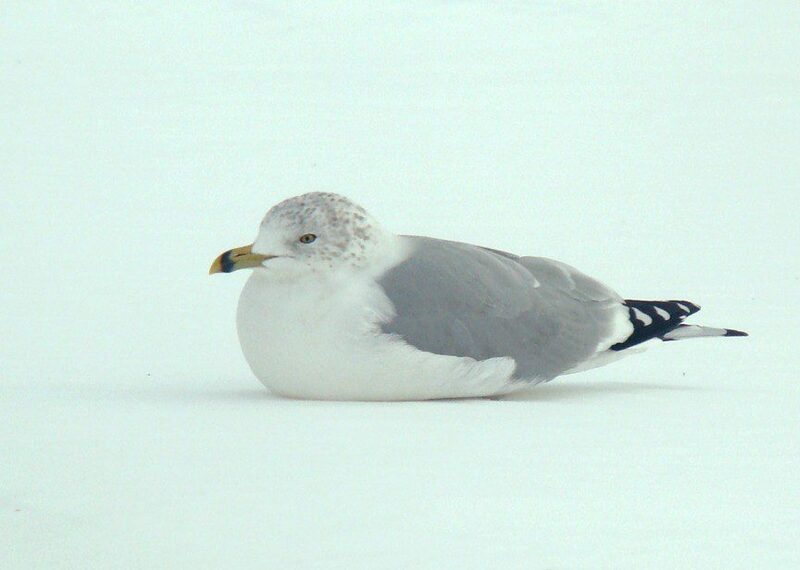 A Ring-billed Gull, Larus delawarensis, sits on the snow near its namesake, the Delaware Bay. Christmas Bird Counts yield tremendous amounts of data about early winter bird populations across the Western Hemisphere. The National Audubon Society compiles this information for science. This is the 110th-annual count, and is a lot of fun to participate in. It is a great excuse to get outside during the holiday season and anyone can participate, whether you are good at bird identification or not. Inexperienced birders are usually paired with those more experienced. You can even sit in your living room to avoid sideways icicles and count birds that come to your feeders if you live within one of the 15-mile-wide count circles. 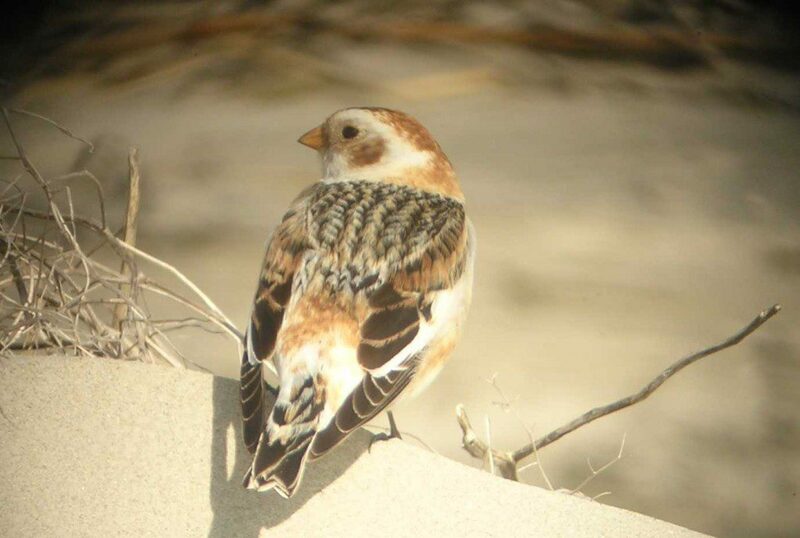 If you would like to join a Christmas Bird Count in Delaware this winter, check out the Delmarva Ornithological Society’s website, www.dosbirds.org to see how to participate. For the Milford and Seaford Counts, look at http://sussexbirdclub.com/. Milford – December 26; Bombay Hook – December 27; Wilmington – December 29; Seaford – January 1; Rehoboth – January 2; Cape Henlopen/Prime Hook – January 3.